Mountain bikers are known to their families and colleagues for their shin scars, their broken bones, and oozing open wounds. We take it as an inevitable but acceptable risk for what we do. But what about the injuries we get off the bike? Are these in fact worse because no fun was had in their making? And do they hurt more because they are not accompanied by the glory of a good story? What is the most painful minor injury possible? The sort of injury that is too pathetic to warrant an Instagram post, never mind a trip to any healthcare professional, but that hurts so much you really want to retire to the sofa with a beer and a block of chocolate just so you don’t make it hurt any more. Here at Singletrack Towers we’re drawing up a list, after a spate of pathetic but painful injuries, all off the bike. 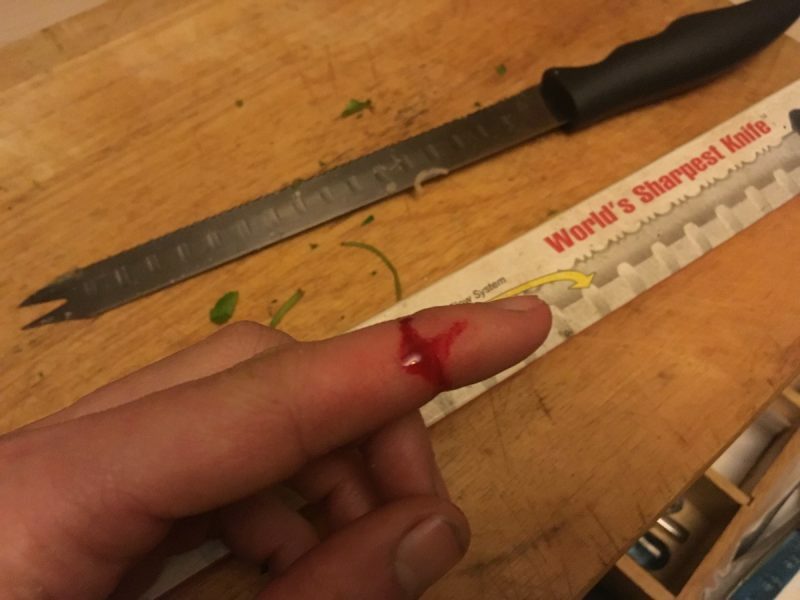 Test knives on tomatoes, not fingers. First up, Wil cut his finger on the ‘World’s Sharpest Knife’. This might actually be more stupid than pathetic. It’s not as if it was ‘The World’s Spreadiest Butter Knife’. Rob Crayons did himself a paper cut. These are evil, as we all know. But something of an occupational hazard for artistic types. They probably have a numbering system to match cuts to different grades of paper. Paintone 01, that sort of thing (Sorry). They didn’t see the hangover coming. Chipps, Mark and Ali gave themselves hangovers. This is definitely just stupid, and does not count in the painful minor injury rankings. Ground, still hard in Sedona. Hannah thinks she has just about collected enough pathetically minor but exceedingly painful injuries to be allowed a day off. She still has her Sedona toe, which is now an interesting shade of burgundy and blue. She also still has what she thinks is a sore sesamoid in her other foot, which she did in late July when she landed that exact bit of her foot on a rock while on a zip wire trying to pretend she’s still young. She is beginning to think she should have sought medical attention for this sometime ago, although plastic surgery is probably cheaper than therapy. Going one up on Crayon’s paper cut, she’s given herself a nasty cardboard cut while opening one of the many boxes of goodies for Fresh Goods Friday, and to top it all off she’s split the nail on her index finger and it hurts every time she types the letters j (ow), n (ow) and som(ow)e oth(ow)er letters too. Or the space bar. Or commas. Ow. On the plus side…actually no, let’s not tempt fate. Let us wallow in our eeny-minor injuries and not think about the bigger things which we could have spannered. There’s still the weekend to go. Although Hannah swears that breaking a finger couldn’t possibly hurt more than her split nail. Are you fighting fit and ready for the weekend? Already thoroughly broken and reading this from the confines of your bed/sofa? Or do you have an injury so small that you’re embarrassed to mention it really, but since you ask, actually yes, this here does hurt rather a lot and, no don’t poke it, I might have to cry and, how did I get it? Well, I was wrestling a lion and, actually I was just making a cup of tea but, it hurts and I don’t think it’s ever going to get better. Whatever your state of health, here’s our regular dose of Friday goodness and freshness to take your mind off all that is wrong with the world, and your body. Apply the arnica, ingest the anti-inflammatories, and ice the throbbing swelling. Raise the cut above your heart, and raise a cheer, for Fresh Goods Friday is here! 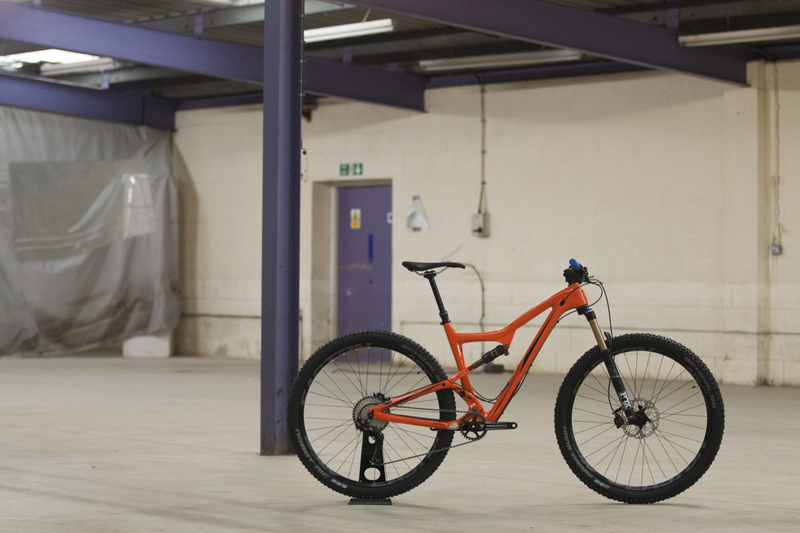 A Large bike, in a very large room. 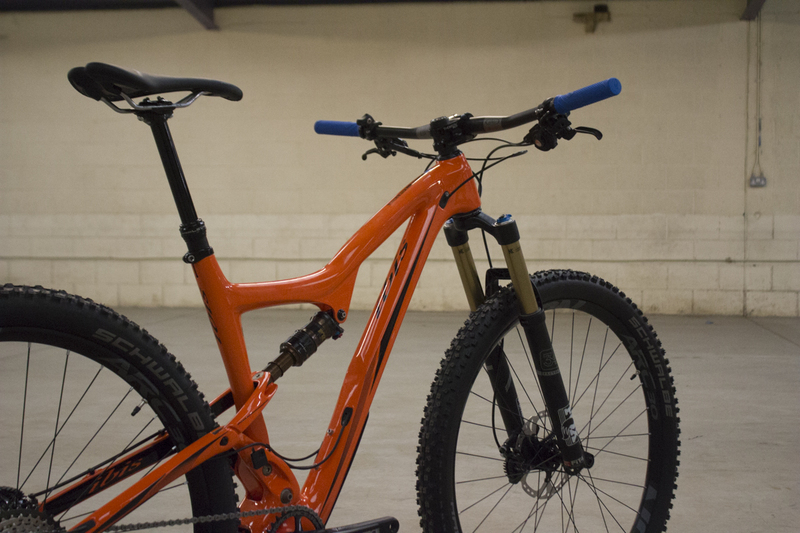 Here we have the updated Ripley, a carbon fibre 29er from Ibis, which is heading into Crayons paper-cut hands for longterm testing. Fortunately for you this arrived after he’d got the next issue of the magazine off to the printers, otherwise we fear we might have had to chain him to his desk. He’s already chewed through the leather restraints. Colour: Tang. Also available, black. 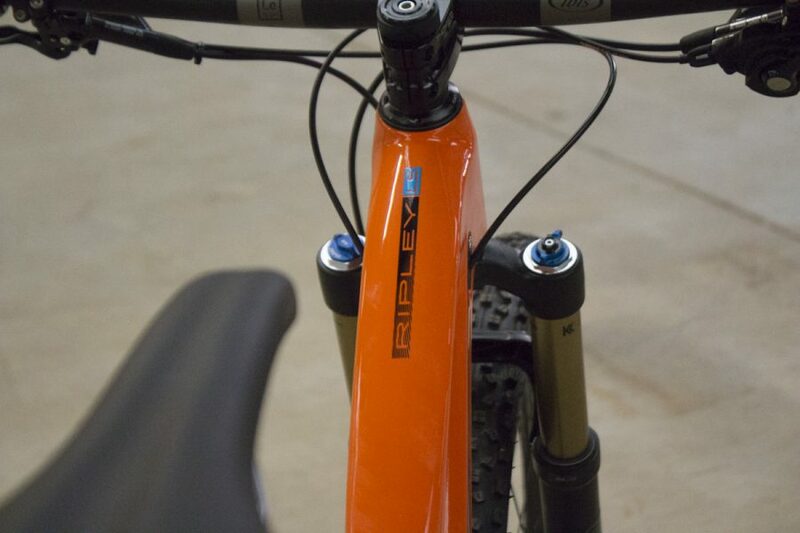 With 120mm travel at the rear, the Ripleys are shipping (we don’t think hypersleep is involved) with 130mm travel up front, although the frame is approved for 120-140mm travel forks. Does the egg of an Alien Queen lie within? This is the LS model – which stands for Long and Slack. 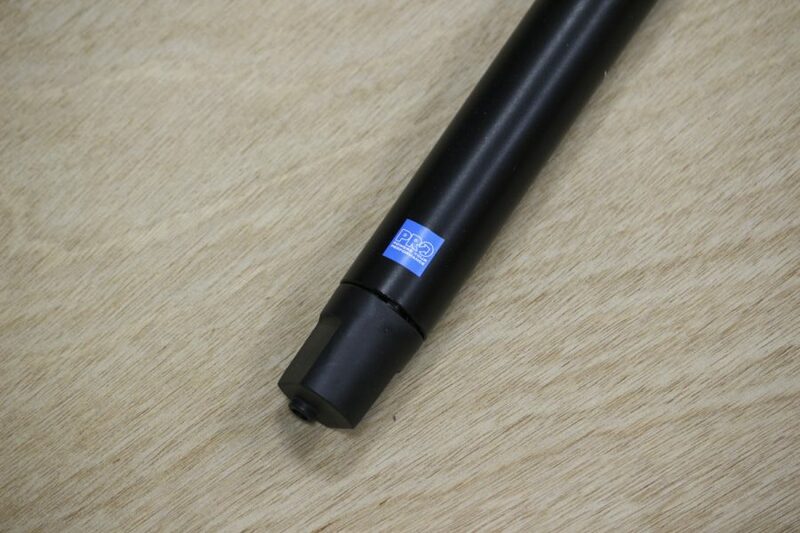 This has a 15mm longer top tube than the original model, and a 67.5 degree head angle. The original geometry version is still available in Medium and Large sizes if you don’t hold with all that new fangled geometry. 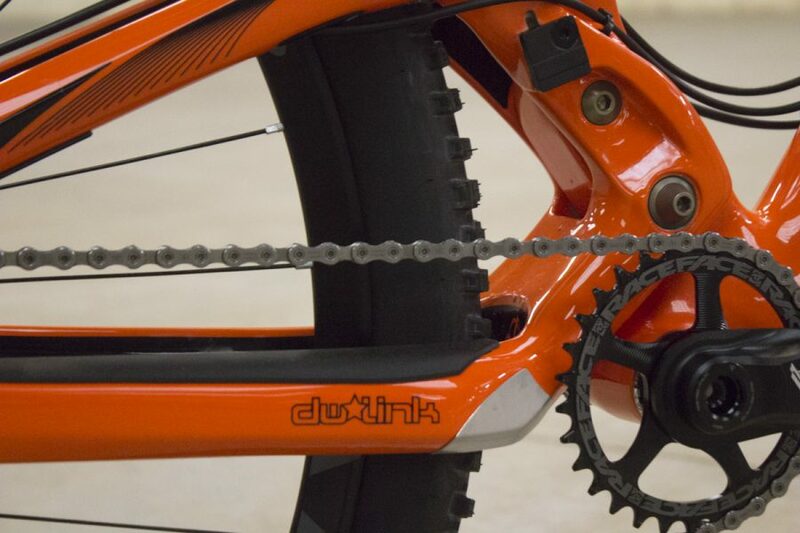 DW link suspension uses two small eccentrics, hidden inside the seat tube, which act as the suspension linkages. For this update there’s been some shifting around of the weight which has added 2 grams but has upped the torque spec on the eccentric shaft bolts. Extra carbon around the eccentrics gives a bit more stiffness. All told, the BB torsional stiffness is apparently up 12%. The new cores are retrofittable to the original Ripley. New rubber protection built in. Tyre clearance for the Ripley and Ripley LS has been increased to accommodate most 2.35in tyres. There’s also a new moulded rubber chainstay and seatstay protector, which can also be bought and retrofitted to older model Ripleys. The Fox Float DPS shock with EVOL sleeve has been tuned to provide more supple small bump sensitivity in the initial part of the stroke and then ramp up to provide better support in the mid to end stroke. Ibis claims the result is a plush ride that doesn’t wallow and pops off of jumps in a very controlled way. Crayons, get jumping. Room for 28T to 36T chainrings. 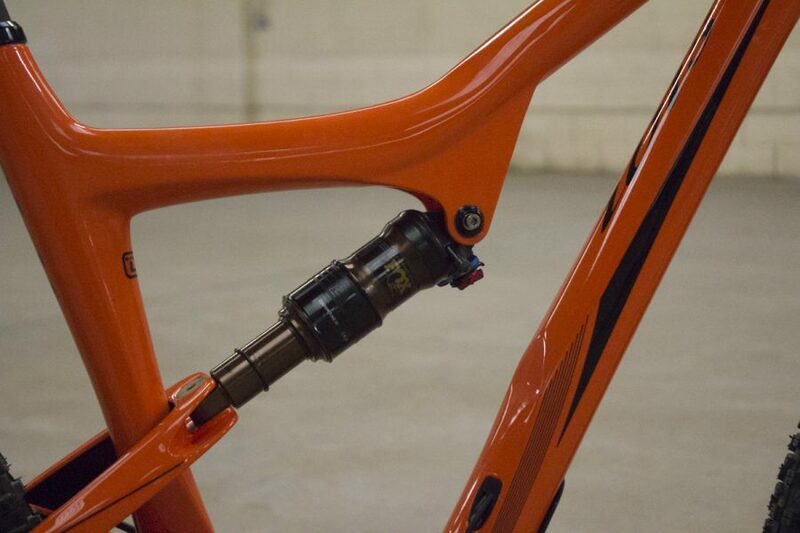 Saying that they’re seeing too much variation between the different manufacturers’ press in cups to get a consistently reliable fit, Ibis has changed to a threaded (73mm BSA) bottom bracket on the Ripley. Also reasonably new for the Ripley is a Boost’d rear end, with 148x12mm dropouts. 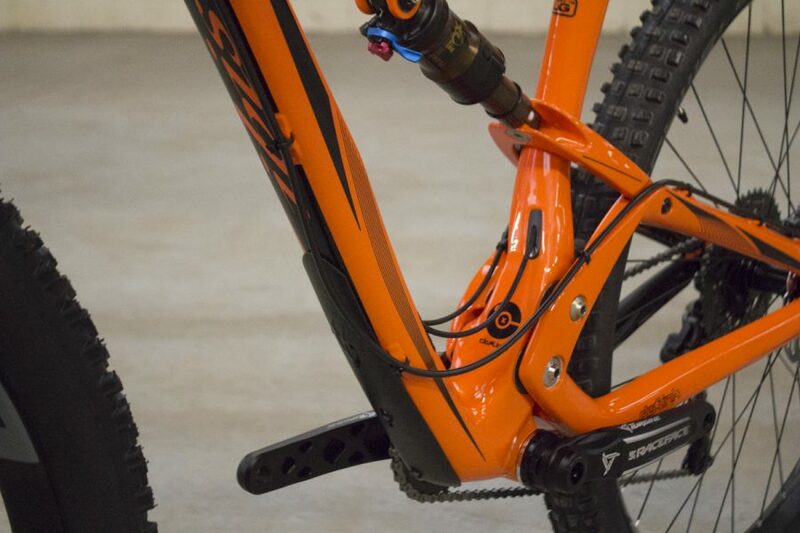 The one-piece carbon swingarm is available as a retrofit for previous Ripley’s if you want more stiffness in the rear. 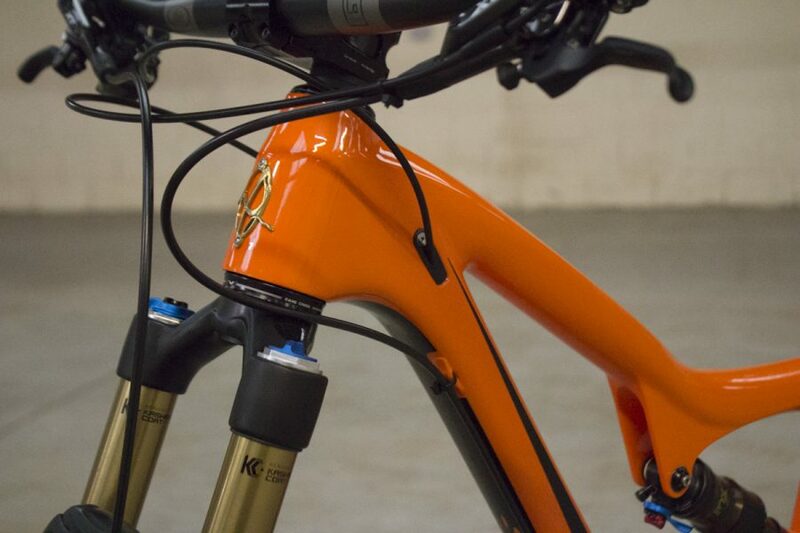 There’s a combination of internal and external routing on the Ripley LS, including Stealth dropper routing. 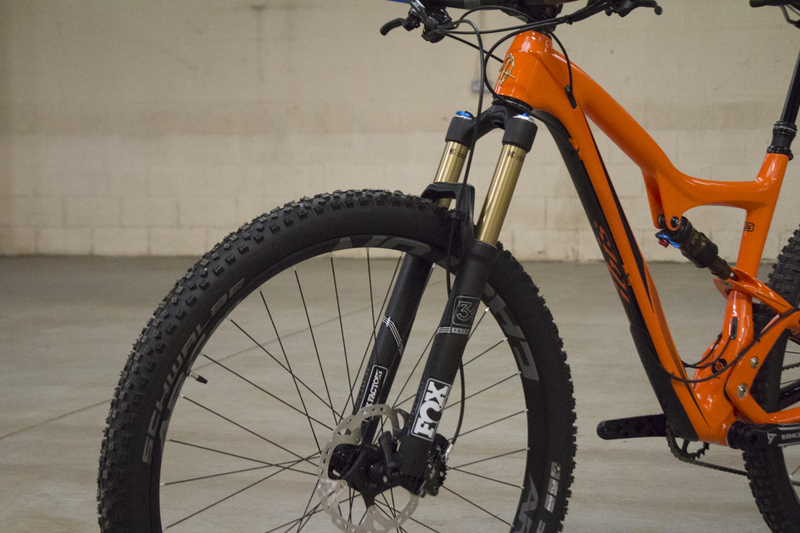 With a long travel Fox 34 fork on the front, Ibis recommends the longer 51mm offset to keep handling crisp with the slack head angle. 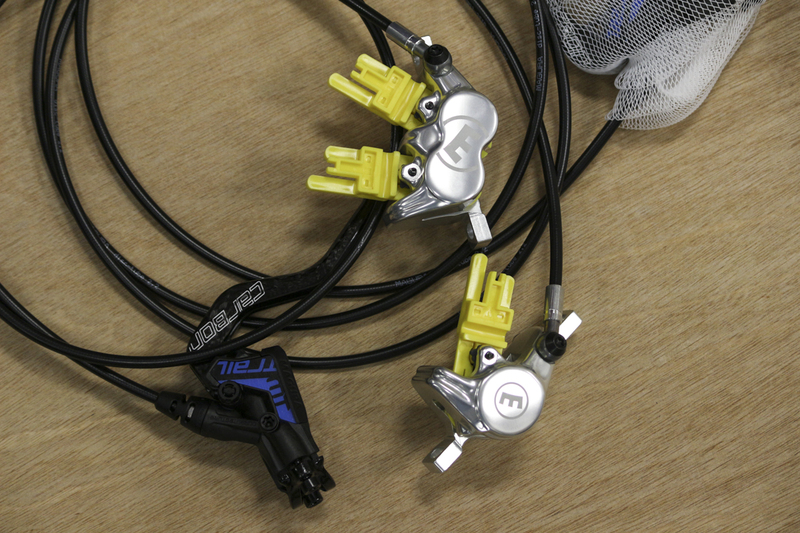 Ibis produces a range of little cable port widgets to adapt to pretty much any configuration of derailleurs and droppers you might have. 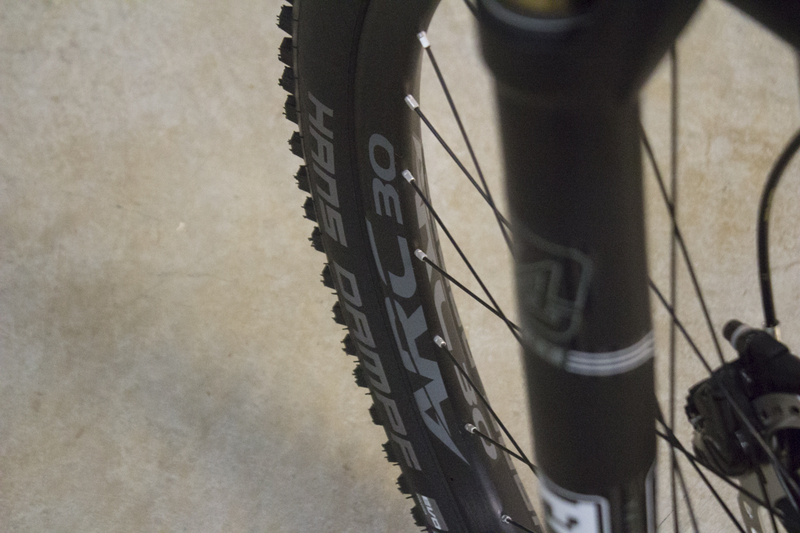 RaceFace ARC 30 rims and Schwalbe tubeless rubber. Previously branded as Easton, the RaceFace ARC 30 rims are made from alloy and provide a nice wide internal width to support fat rubber. 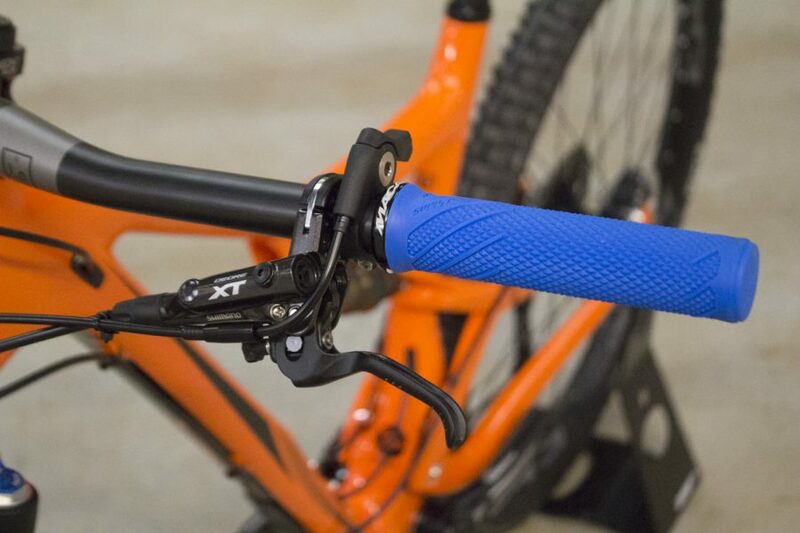 Thin Danny MacAskill lock-on grips from Lizard Skins. Being from 2pure, the Ibis Ripley also came outfitted with a set of Lizard Skin grips. These are the super thin Danny MacAskill lock-on grips that Crayons will be reefing on with his tongue hanging out his face. Glossy orange paint job in a post-industrial warehouse space. Man. 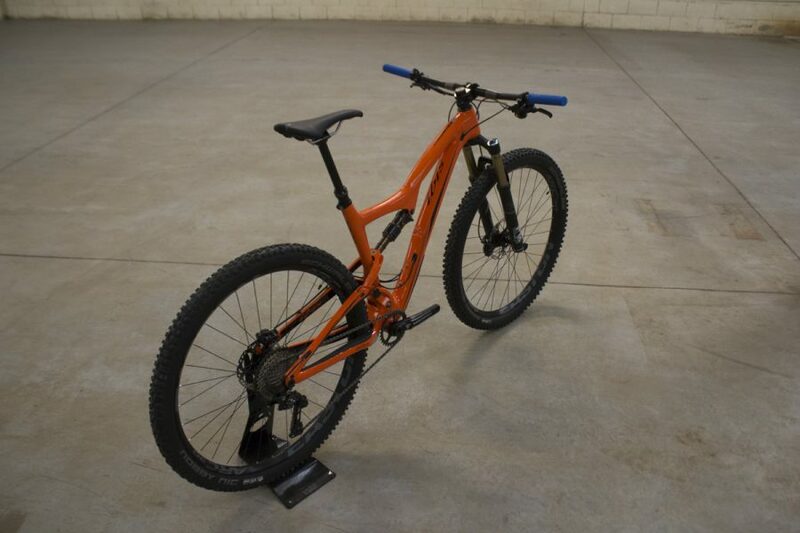 Keep your eyes peeled on Singletrackworld.com for incoming updates and reviews on Crayon’s new whip, which will also be subjected to additional components that we have on test for the magazine. BOOM! May also double up as tree toppers. Designed to minimise vibration to give you consistent braking and a quiet ride, and available in 140/160/170/180/200mm sizes. Handy for when you decide at the last minute that maybe your not up to that jump after all. STOP! The ProTactic 250 AW delivers high performance to pro photographers who need a rugged yet scaled-down, urban-inspired pack that delivers on all fronts: accessibility, versatility, comfort and organization. Never miss a critical mission thanks four access points: the molded, turret-loading top, quick-grab from both sides, and full, back entry for set-up and security. We suspect Chipps just wants an excuse to go buying some new camera toys to put in it. But we like he idea that our photoshoots are critical missions. 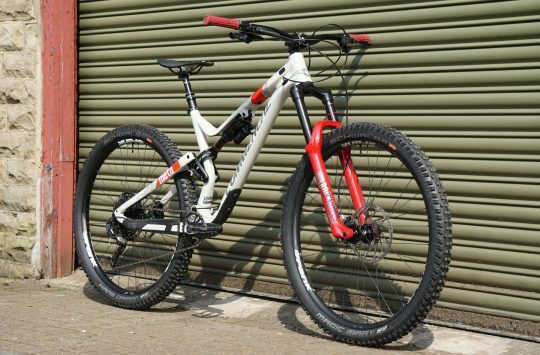 Ten-four zulu six-five, we have a 650B coming your way now, shoot on sight, repeat, shoot on sight. 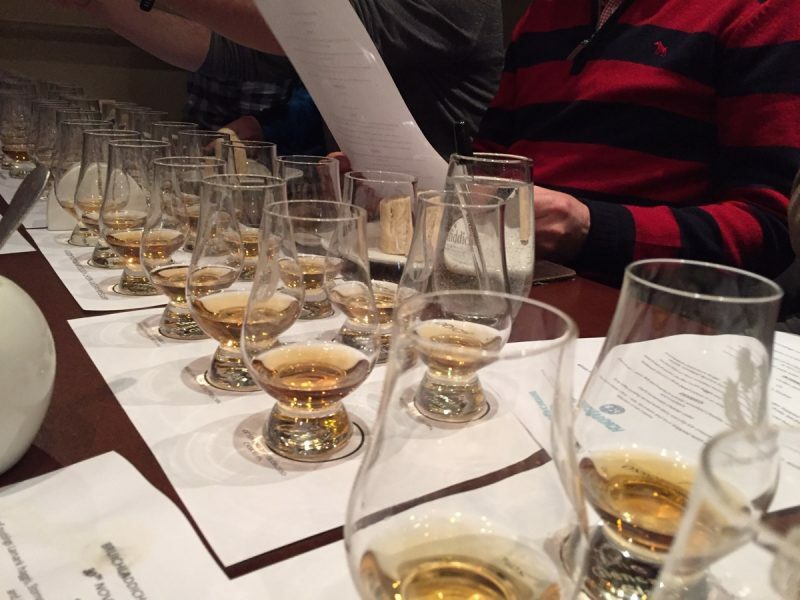 …In Todmorden, this left few suitable hosts. The product, as its creator intended. 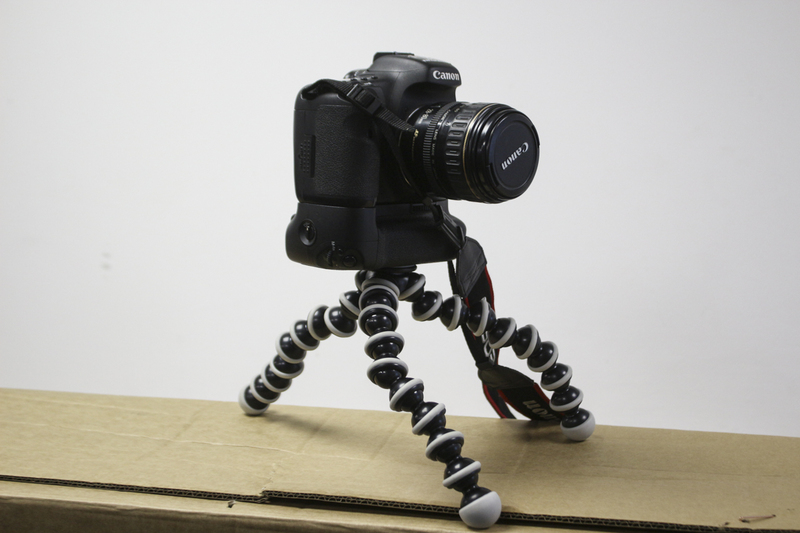 Handy tripod gadgets for balancing your camera on all kinds of surfaces. The screw has an adaptor, so will fit either an SLR camera or a GoPro. Zulu six this is Alpha one, please deploy Joby 1 at six o’clock, we have Bravo four incoming, shredding it hot. Is it walking off with our tablet? 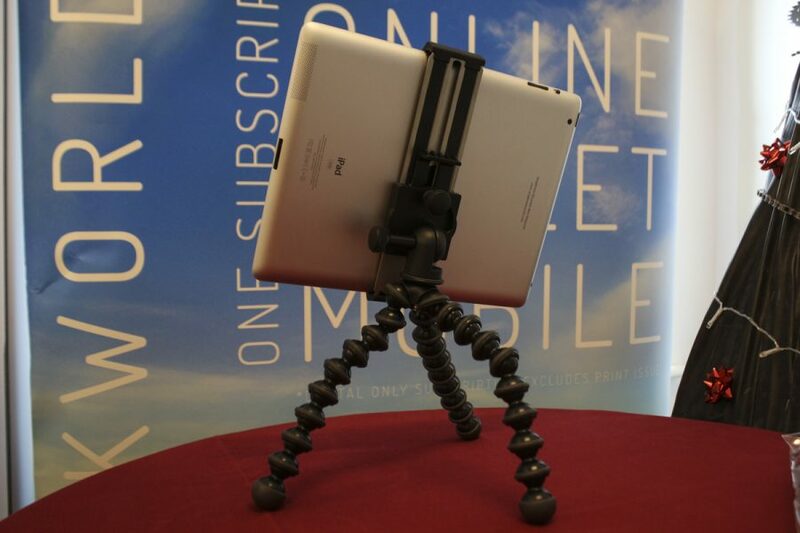 More handy tripod action, this time designed to hold a range of tablet devices, which is coming in handy with all the Facebook Live broadcasts we’re doing at the moment. Fit your GPS computer, light and camera to your bike with this single mount system. No more fingers over the flippin’ lens. 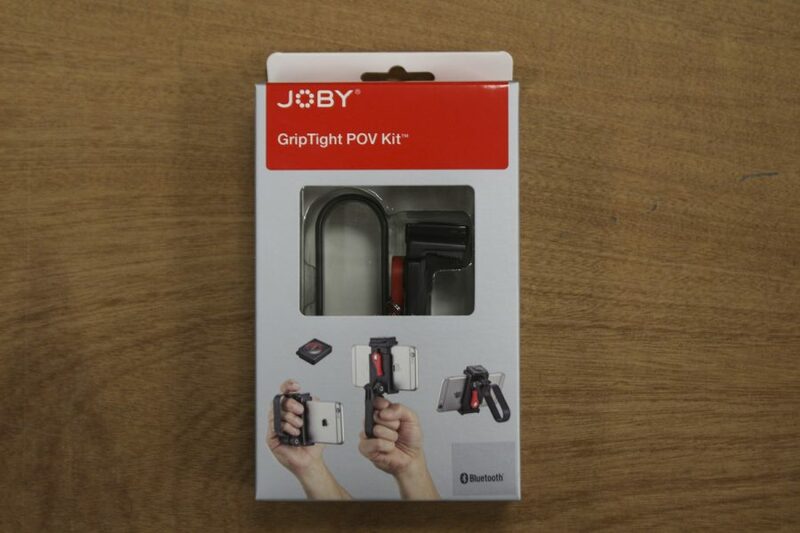 A smartphone mount that gives you a camera-like grip for taking photos, alternate grips for making smooth video or creative angles, plus there’s a remote so you can take pictures from up to 90 feet away. Oooh, what’s inside? Is it Chipps’ sponge bag? Not Chipps’ sponge bag…we hope. 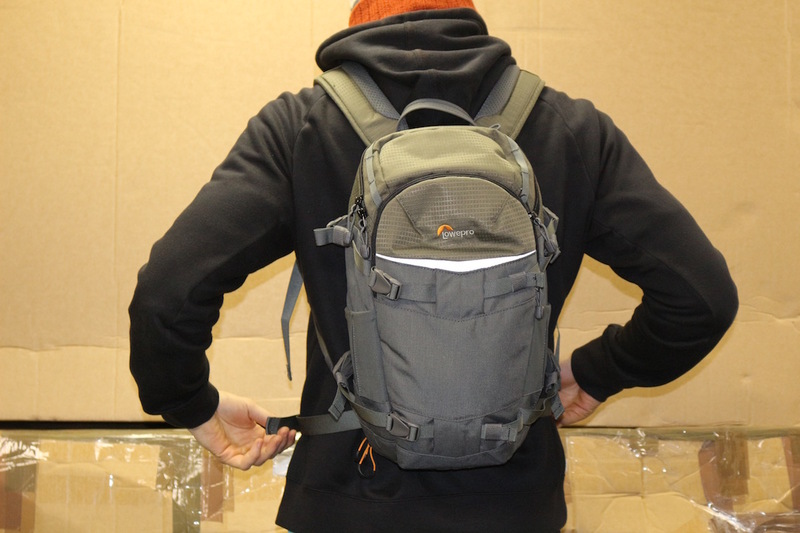 A handy pack to carry all your GorillaPods. 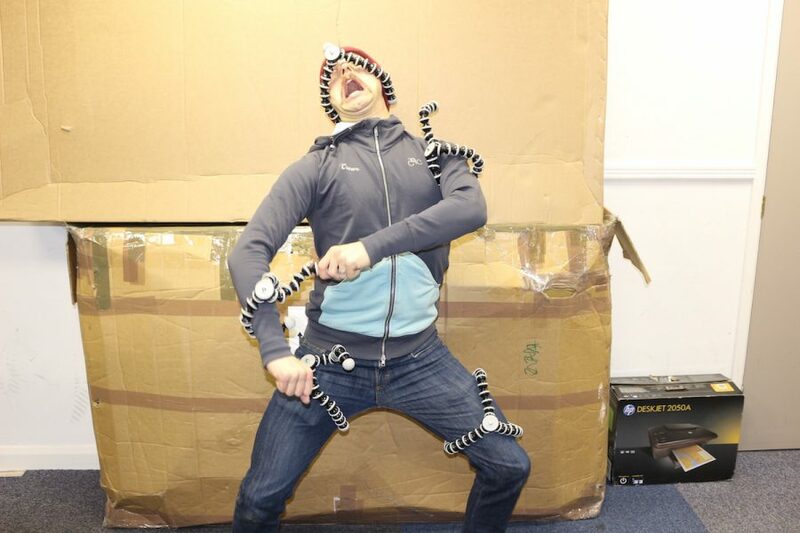 A GorillaPod Pod in fact. 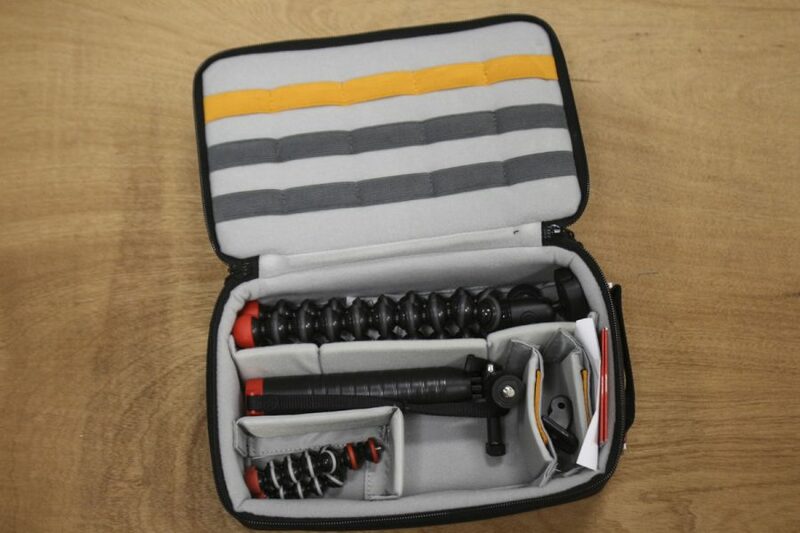 Contains three tripods of different sizes, with fittings for either a GoPro or SLR camera. 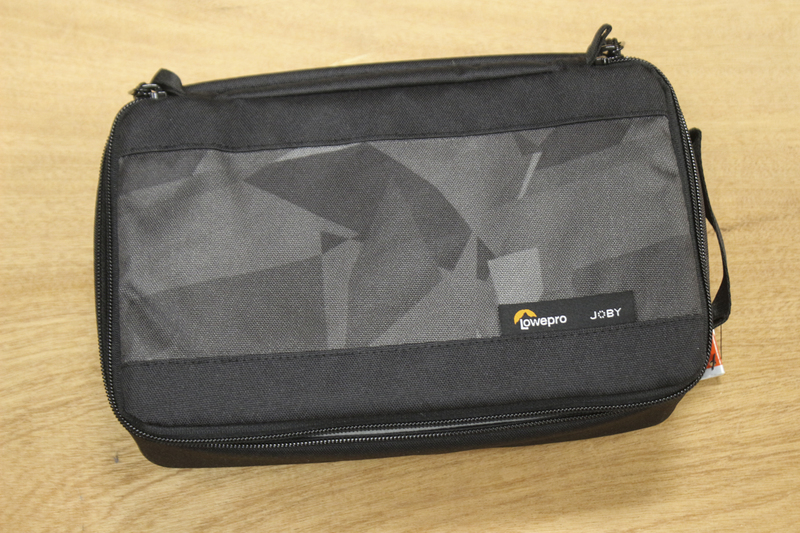 Space left over so you can store your GoPro or other extras safely in this padded bag with adjustable dividers. 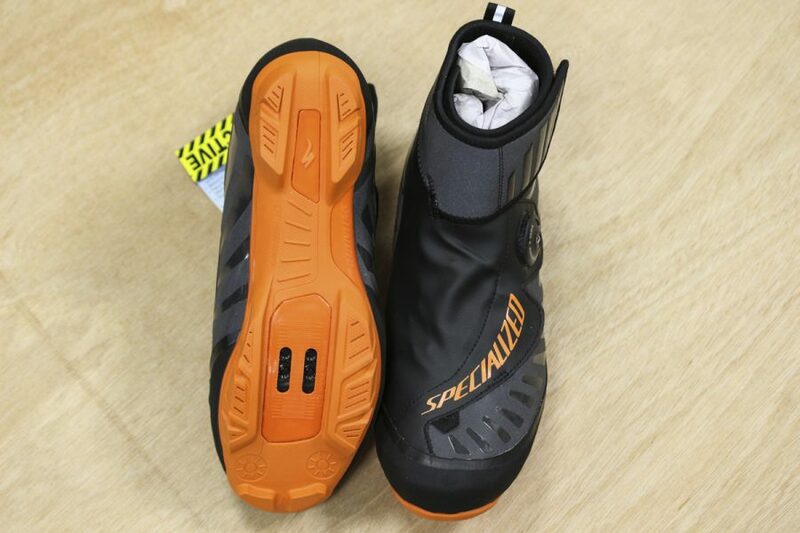 A seam sealed internal bootie keeps your feet dry, while Thinsulate® 400 gram insulation keeps your feet warm. Rubber tread provides grip, and the neoprene collar keeps the water out and the warmth in. Winter, we are ready. Is it a light, or another alien? Dark? What dark? 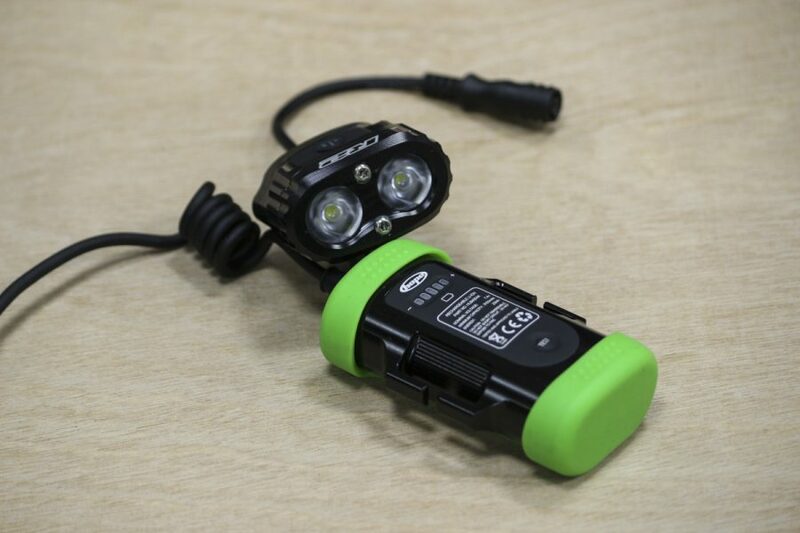 Two LEDs give 1300 lumens and will last between one and thirty hours depending on which of the six settings you use. 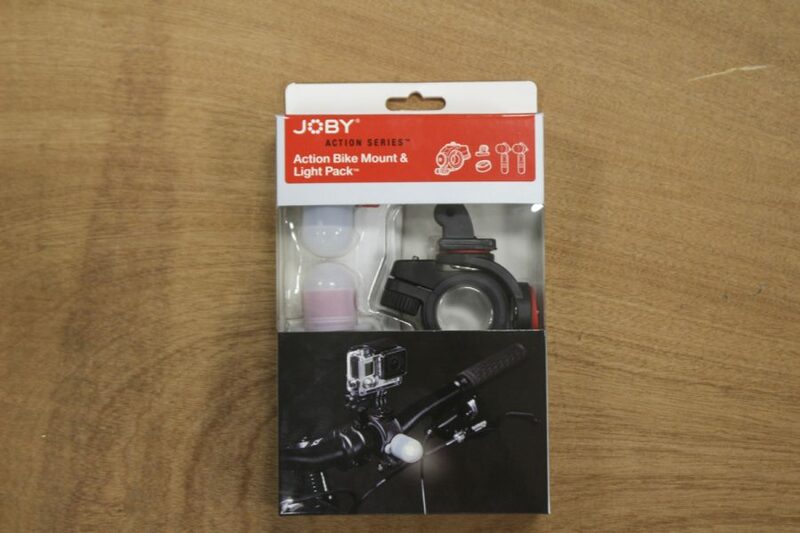 The pack includes a bayonet fitting handlebar mount, helmet mount, head harness and 1m extension cable. No excuses for staying in – get out in the dark and play. Sent to us to mark Thanksgiving, just in case we’d forgotten to provide a non-turkey based vegetarian option. Many flavours are available, all are vegetarian and probably taste better without gravy and trimmings. Price: £490 for a front and rear. Rotors £25 each. 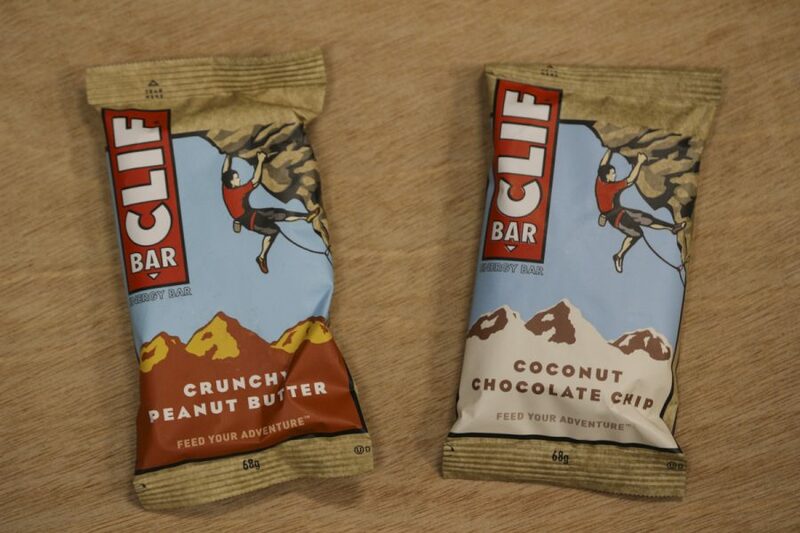 We told you about these before, and now we’ve got them for real. 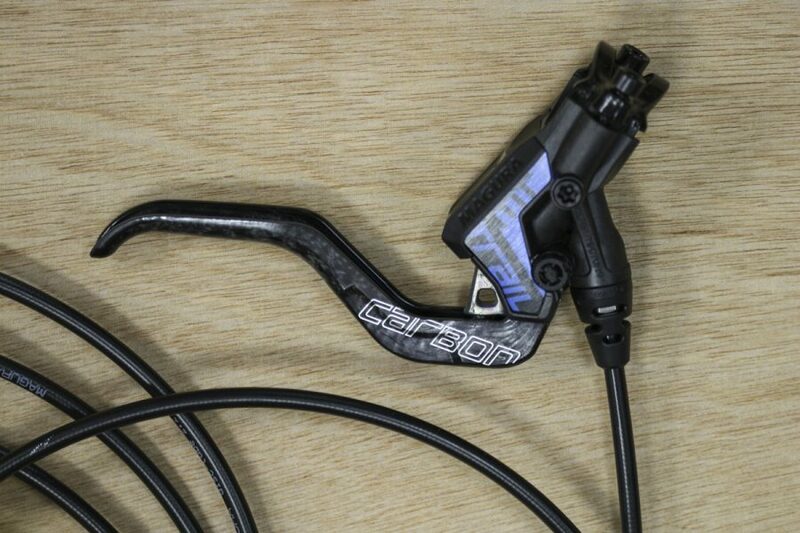 These are the new trail brakes from Magura, with four pistons up front, and two pistons at the back. 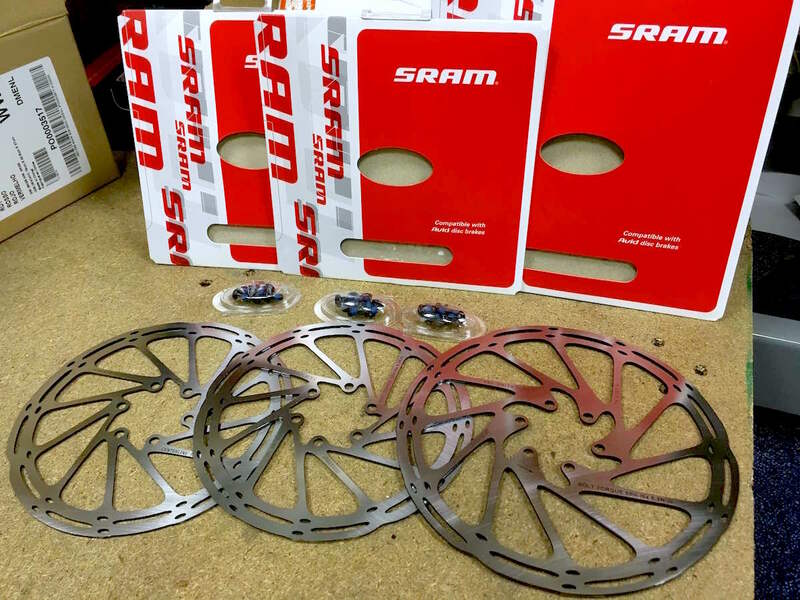 160/180 or 203 HC Storm rotors are available to go with them. High-gloss chrome calipers and visible carbon lay up levers. Bling-a-ling. 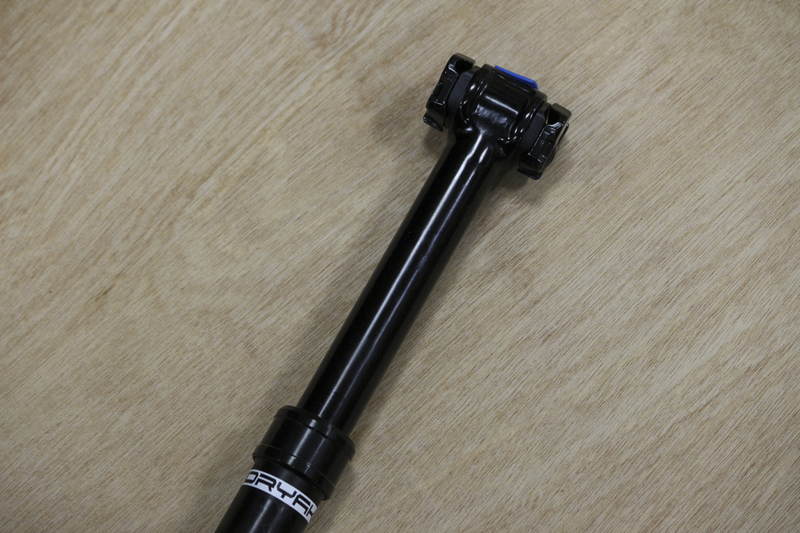 Unveiled at Eurobike, this is a dropper post from Pro Components, made by Shimano. Claimed weight is 520g including the remote and cable. 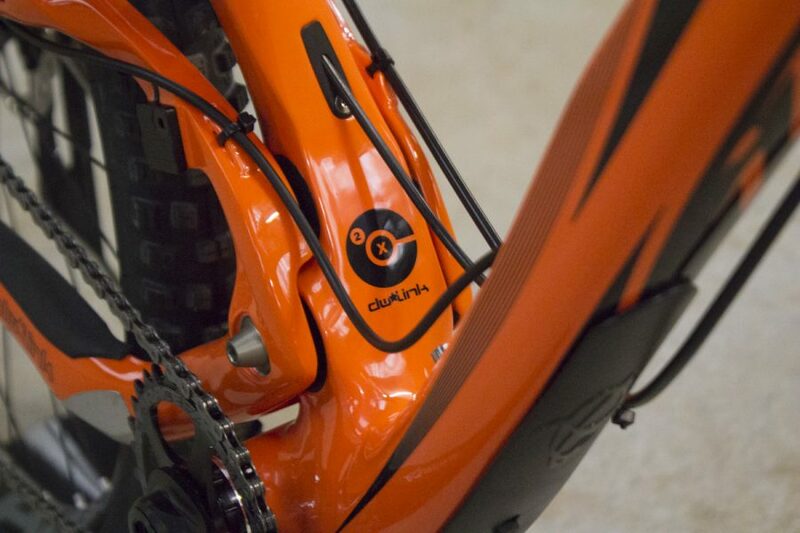 Cabling is internally routed, and Shimano claims the ‘Optislick’ cabling will keep running smoothly in the face of dirt and mud. We’re sure we’ll be able to put this to the test without to much difficulty. 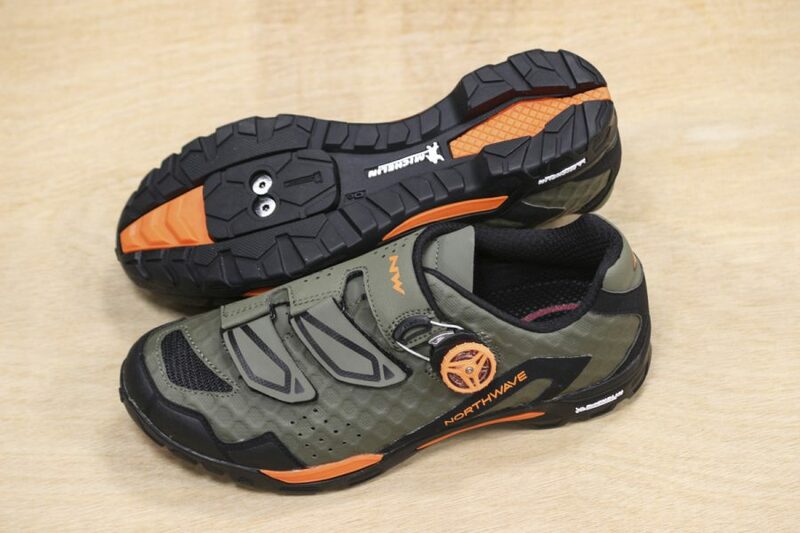 Bridging the gap between bulky enduro style shoes and stiff and XC style shoes, suitablefor everything from trail rides to gravel bike outings. There are three versions, these are the Speed Dials, and there is also a lace up (£69.99) and three strap option (£79.99). Price: £5.99 (Trumps 1), £6.49 (Trumps 2), £9.99 (Both). A Pace RC 100 makes this deck. A game, not something that happens after a few too many gels. 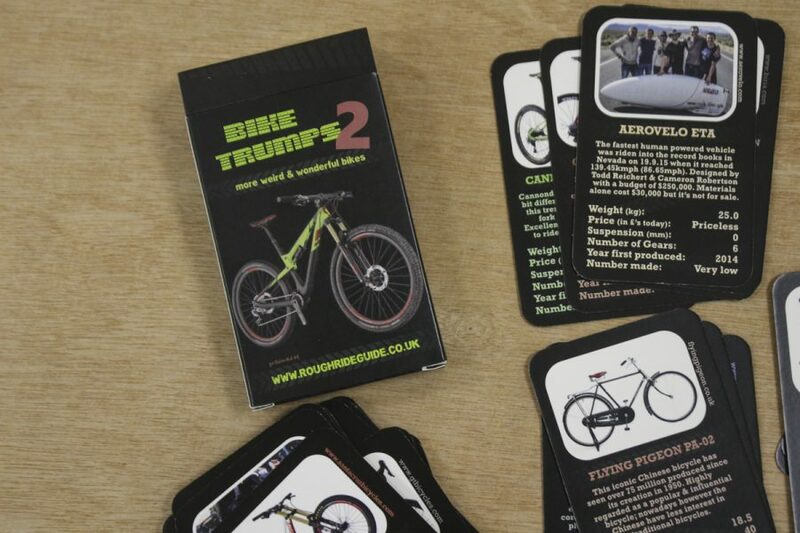 Based on the no doubt trademarked Top Trumps concept, this either a game to play with your friends, or a vital collection of data that you can learn and then use in conversation when trying to make friends*. 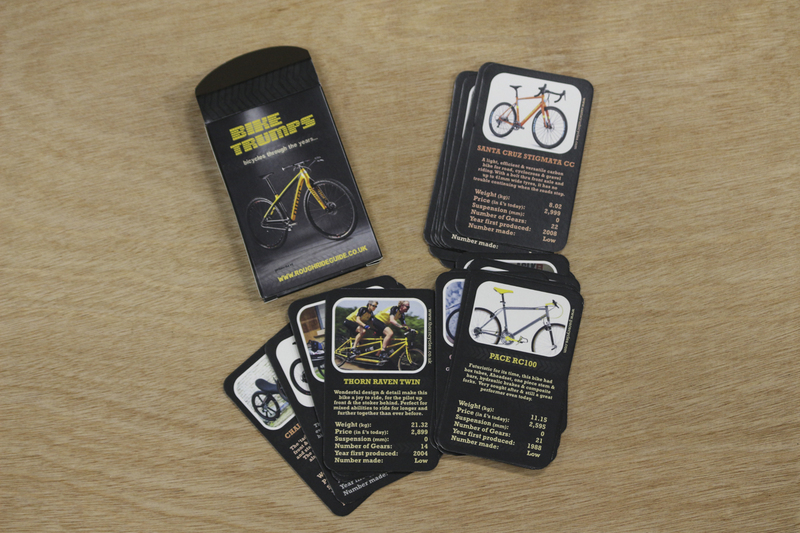 Available in two sets, for maximum fun, in depth geekery, and very very long games if you combine the packs. A Flying Pigeon, as ridden by Guy Martin. *Other conversational gambits may prove more fruitful. With no side seams, a double layered gusset, and made from Merino, these are boxers fit for the most treasured of family jewels. Crayons’ ‘glance left’ casual pose. More Merino loveliness from the New Zealand manufacturers of many Merino things. In advance of the UK launch of the Spring/Summer 2017 kit, we were invited to pick some items from their catalogue. 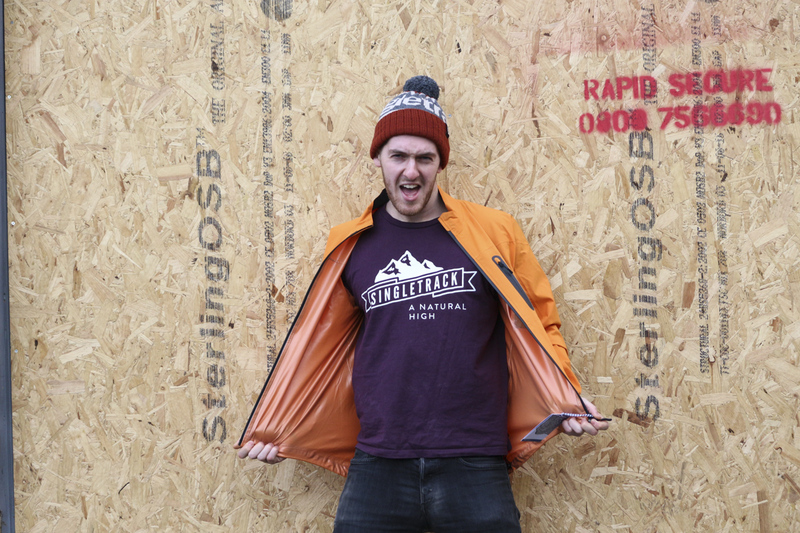 Unfortunately ‘all of it, fill the shipping container’ wasn’t an option, so we’ve only got a small sample of their huge range of attire. 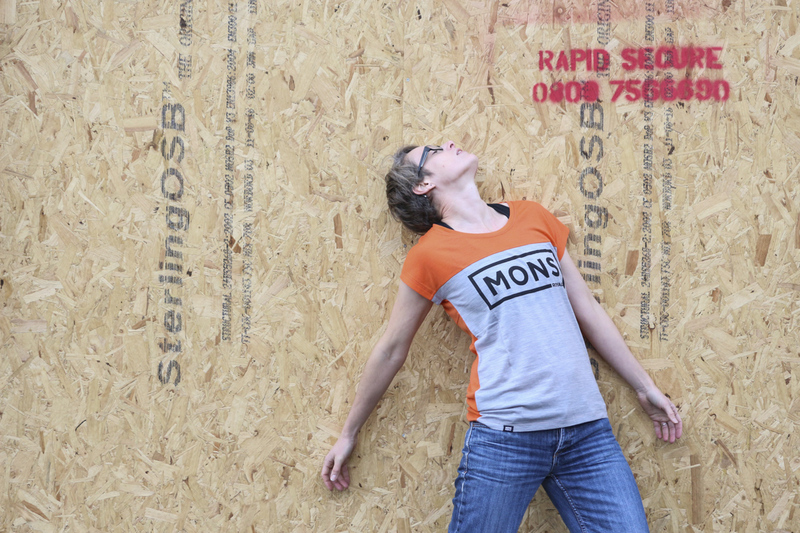 This casual ride-then-pub-date t-shirt has mesh underarms for if you get a bit hot under the collar. Although you could just un-do the buttons too. Crayons’ ‘hip and right’ casual pose. 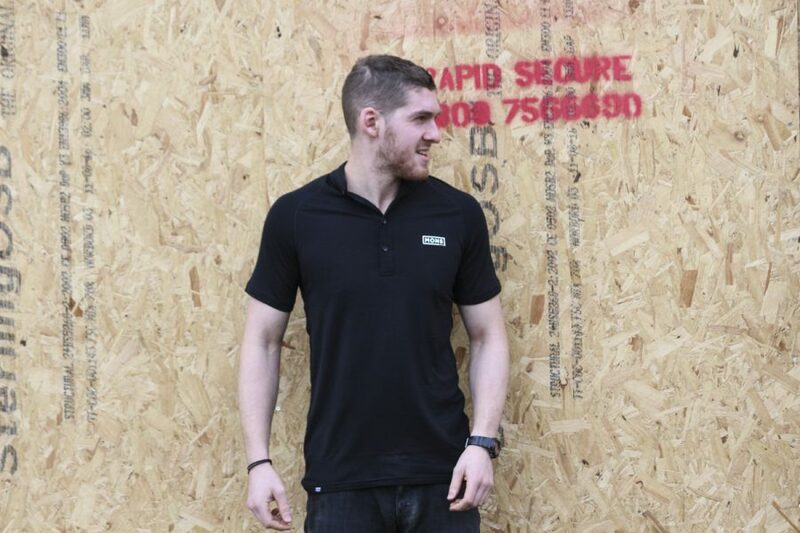 Made from Mons Royale’s Merino Air-Con fabric – a superfine 140gsm fabric made by wrapping a spun merino yarn around a superfine nylon/elastane core – this is a lightweight 3/4 t-shirt for a casual riding look. Aliens, please land this way. 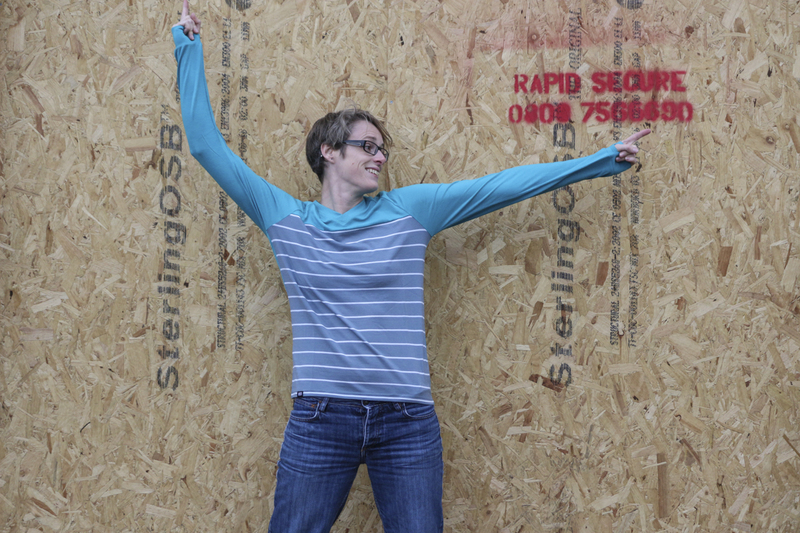 More Merino Air-Con, this time for women, and with thumb loops. 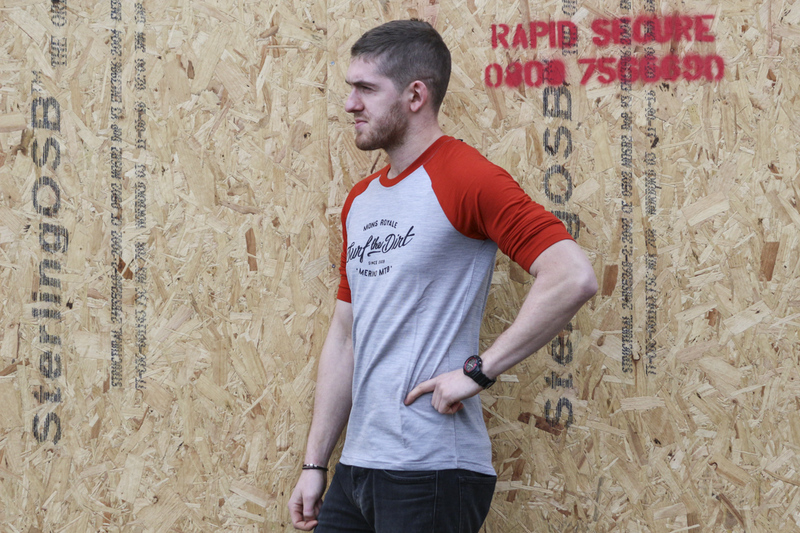 The tops are designed to look good, feel good, and be practical out on the bike. Is Hannah modelling, or catching a peanut? 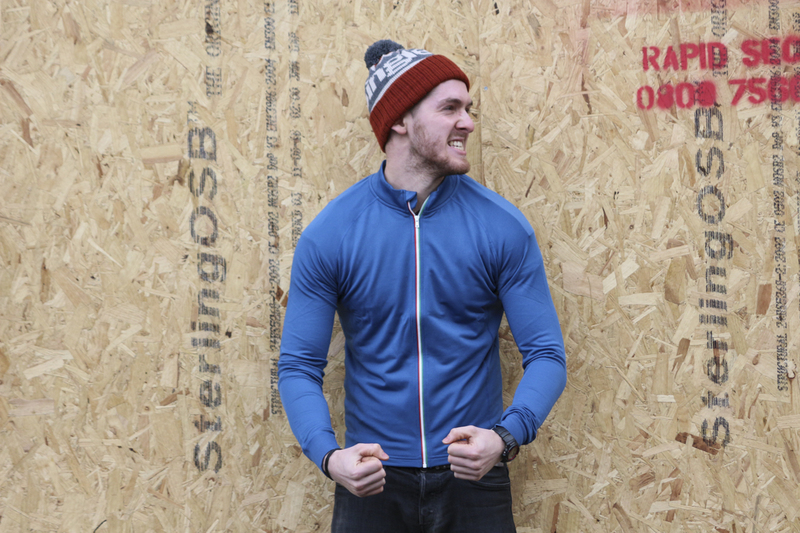 If smell resisting sweat wicking merino isn’t practical enough for you, this T-shirt also features a mesh vented back to help keep you cool. The drapey soft fabrics inspired Hannah to to Vogue style awkward neck angle model poses. Just as well we’re not Vogue we think. Hannah tested out the women’s Shewaddywaddy earlier this year. Now the boys can stop being jealous, as they have their own men’s version in to test. 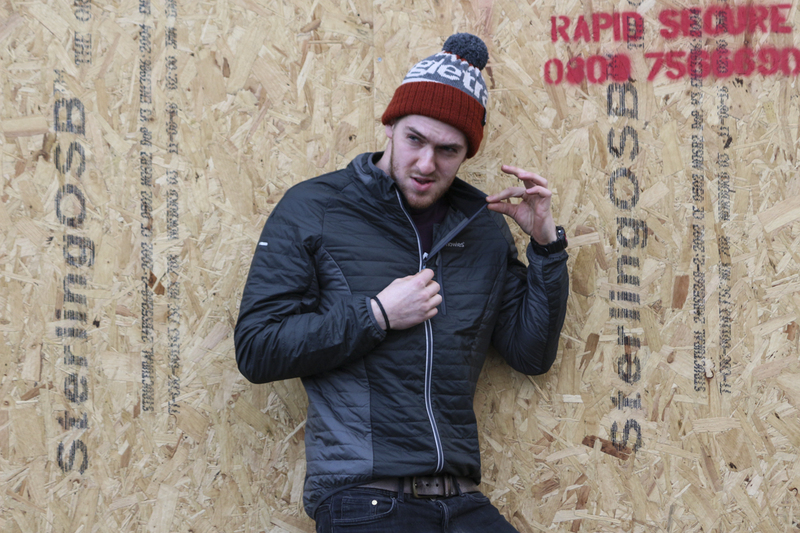 It’s a lightweight wadded jacket with a windproof ripstop nylon outer, Primaloft fill on the front facing panels and unwadded back sections to stop you overheating. Stuffs down into its own pocket for handy carrying, or impromptu travel pillow. 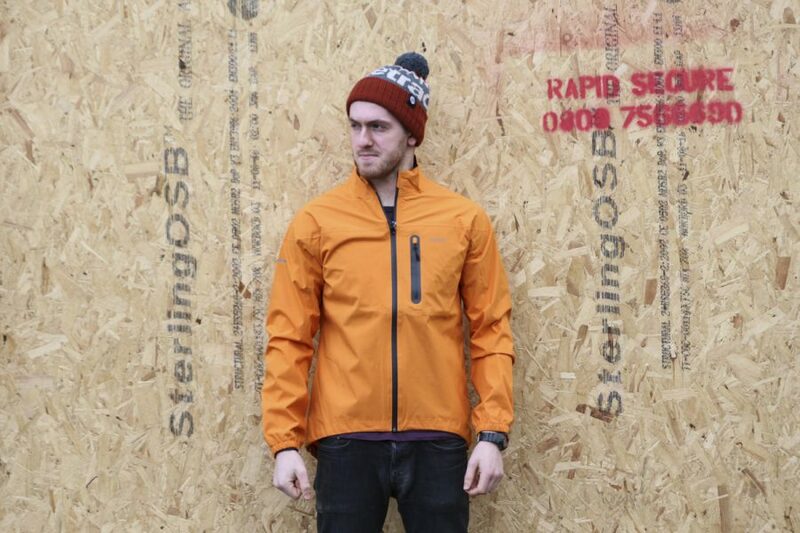 New for this year, a waterproof and windproof jacket made from an environmentally friendly fabric which is 100% recyclable and flourocarbon free. It has taped seams plus a fleece lined collar for added cosiness. Trying too hard now, Rob. Nice subtle retro styling on this jersey which has been updated for this year. Those are not Italian colours – they’re Welsh. Made from a mix of Merino and Sorona fabric. Sorona apparently uses partly plant-based glucose from renewable corn starch crops as a replacement to 100% oil-based fabrics, which means it consumes less energy and produces lower greenhouse gas emissions than petroleum-based fabrics in production. 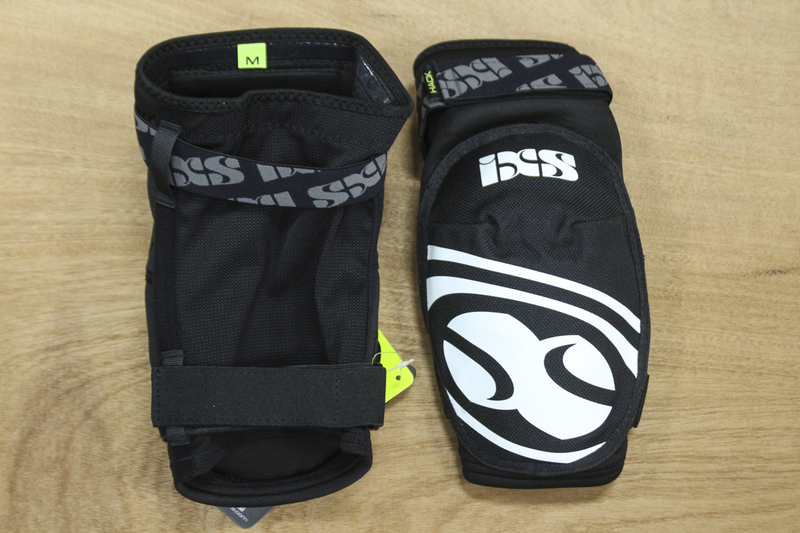 Made with NockOut shock resistant padding, these are lightweight pads heading for our big pads you can pedal in group test. Adjustable velcro straps top and bottom for fine tuning the fit. The first print run has already sold out, but there’s a second one coming. 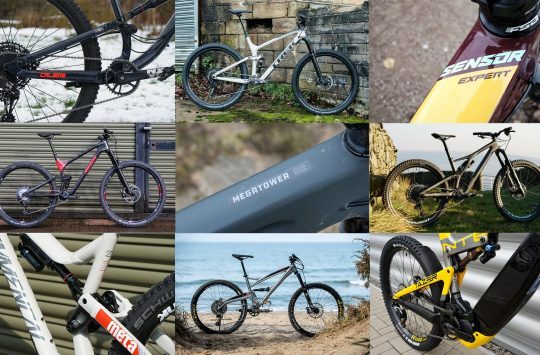 20 years of mountainbike imagery from Dirt. 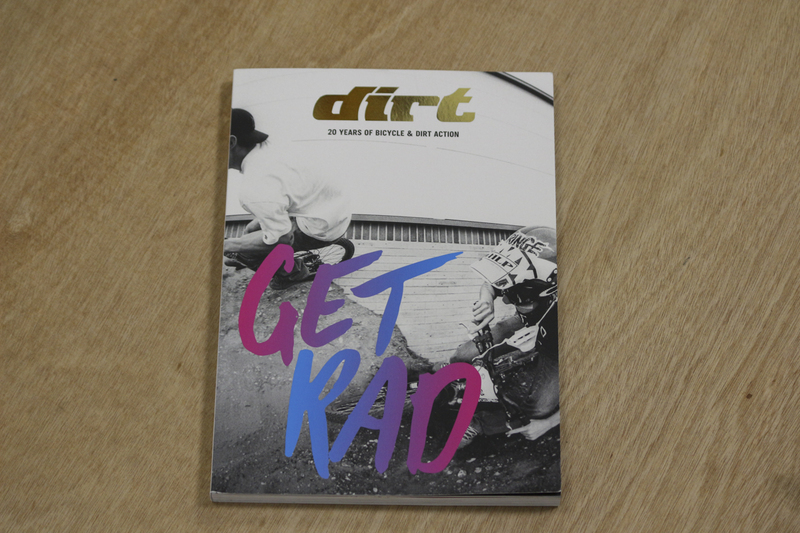 New designs from our Premier Dealer Rad8. 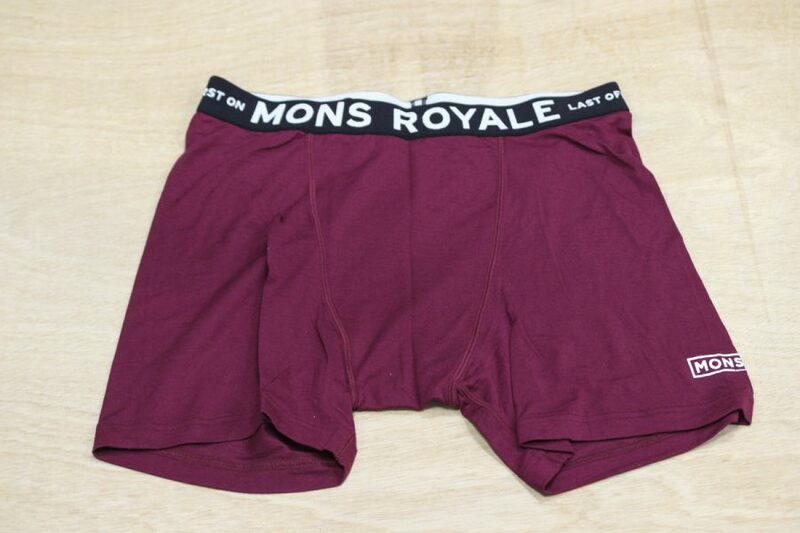 As may or may not have been worn by a variety of famous and infamous people. 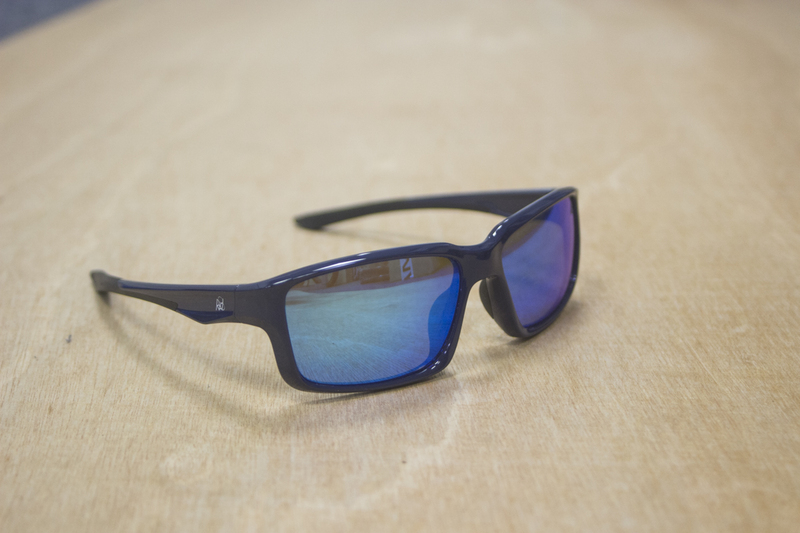 Anti-fog, anti-scratch coating, and impact resistant polycarbonate lenses – and stylish too. 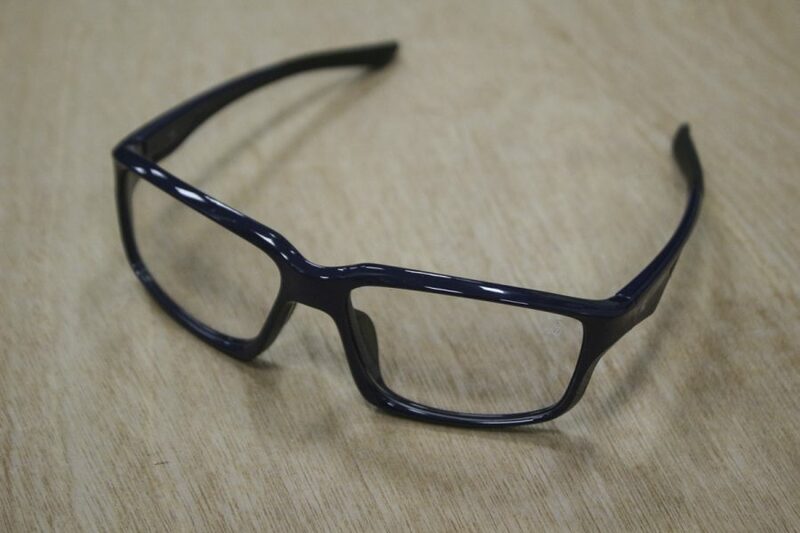 The frames were selected by Singletrack readers as being their preferred design from a range of possible options. Singletrack Subscribers get 15% off the RRP. This is the Red Mirror coating version. If you’ve had your colours done and your stylist says red makes you angry, or look old, or whatever, then you can opt for the Blur Mirror version. 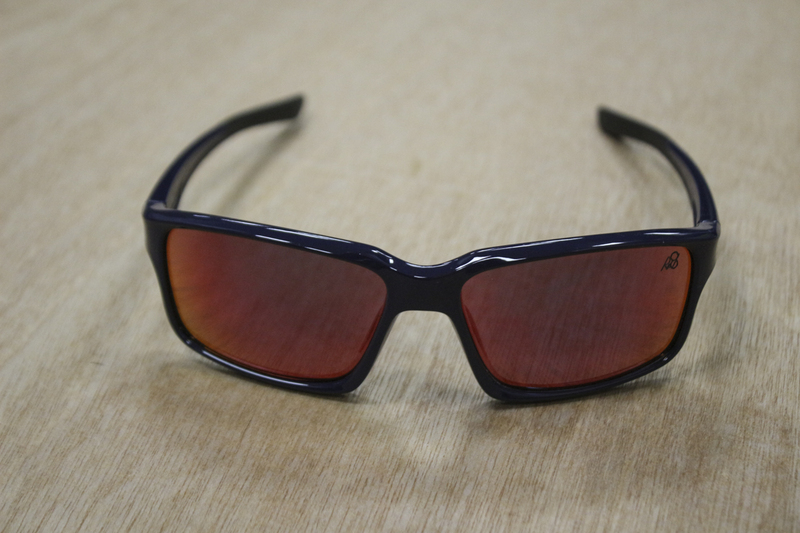 If you can’t decide between the colours, or you want glasses for every possible weather condition, then the photochromatic lens option could be for you. Same price applies to all three lens options, as does the 15% discount for Singletrack Subscribers (which makes them £74.80). Whether you’re in or out this weekend, be sure to shake it all about. It is surely not possible to sit still while listening to this, although the crowd in this version are doing their best to do just that. Video: The Evil Calling Is A Chubby Shredder! Gorilla pods go loose after a while, mine doesn’t stand erect anymore and flops about all over the place…. There’s tablets you can get for that.. 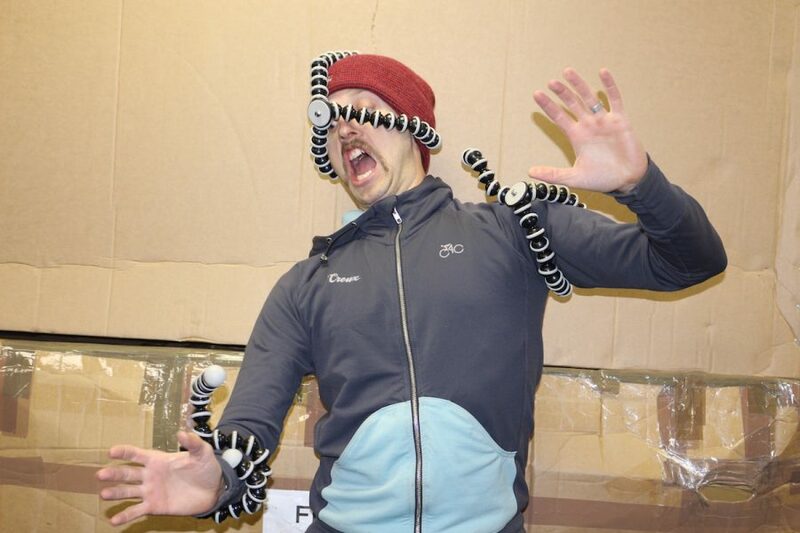 The Wil vs Gorillapod pics are ace. Good work guys! You can get pills for that. Excellent to see return to 73mm BB on the Ripley – now quite far up the new bike dream list. 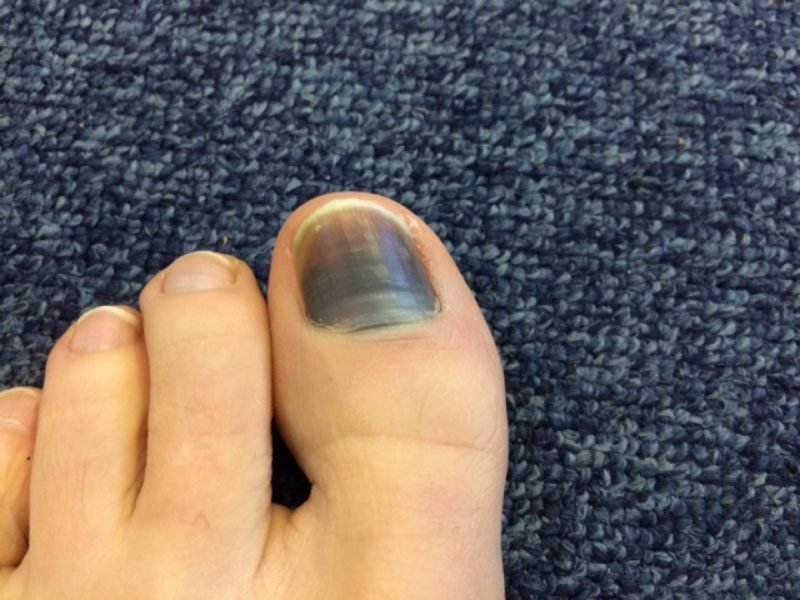 Well done to Hannah for colour co-ordinating her toenail with the carpet. 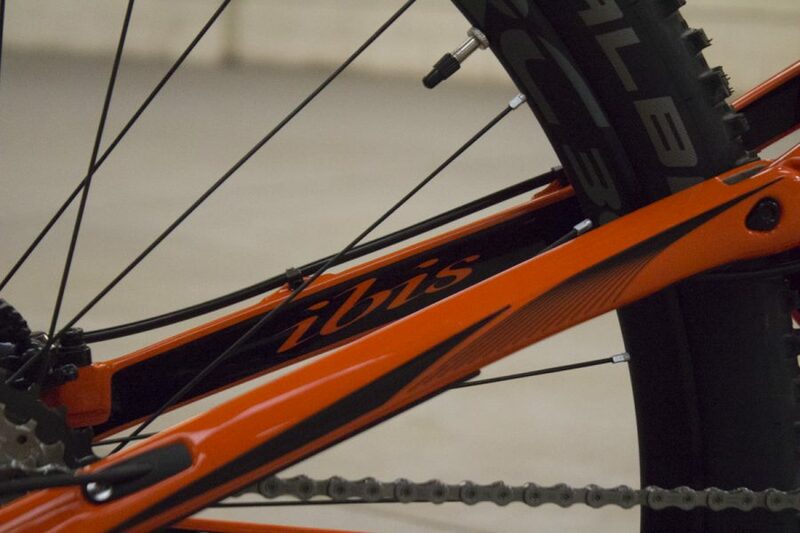 Good luck ordering anything Ibis through 2Pure, it took them 18 weeks to get my Mojo HD3 frame to me, shower of SH*T! Genuine lol from those of us who install good pressfit BBs all week long. Never been the BB at fault. Not once. Easton and RaceFace are both owned by the same company. While both brands have made road & MTB product in the past, moving forward all the road and CX stuff will be branded as Easton, and all the MTB stuff will be RaceFace. 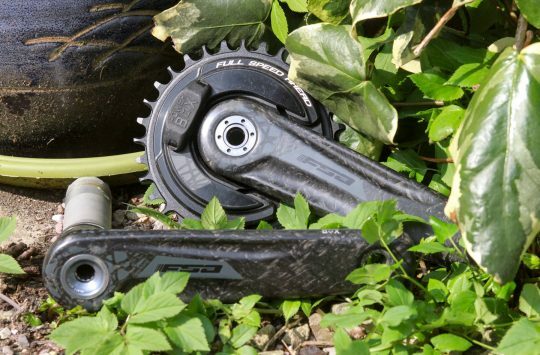 Did Easton hubs not have a reputation so bad, even Crank Brothers felt sorry for them, hence the re-brand? The Ibis they’re attached to, however, yum. Quite possibly @mountainsifsussex, but my guess is that there were a number of factors behind the decision. 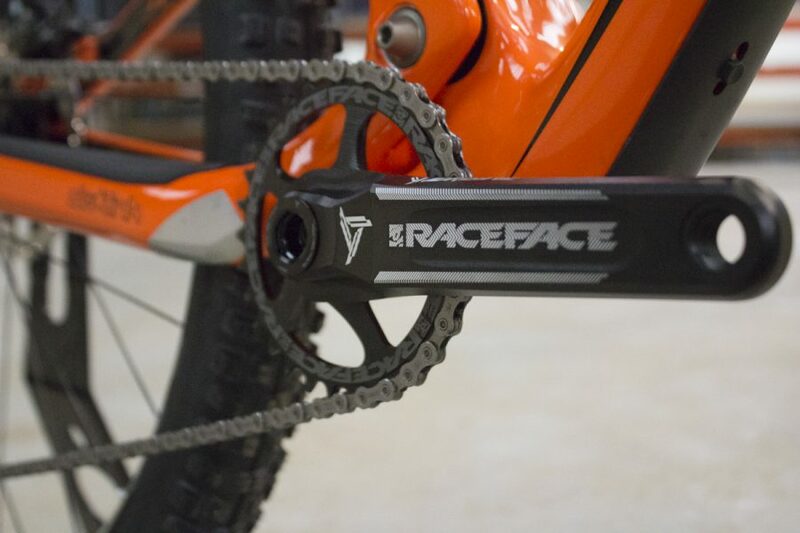 The fact that the company initially offered a dropper seat post that was available with either Easton or RaceFace branding did seem a little odd, so our guess is that this will help separate the two brands for less confusion.